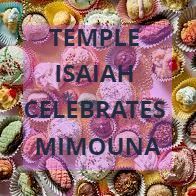 Saturday, April 27 | 7:00 p.m.
You are invited to a joyful celebration of MIMOUNA at Temple Isaiah. What is Mimouna? Mimouna is originally a Moroccan Jewish tradition marking the end of Passover that spread across North Africa to Europe and America. The community gathers together to feast on all the foods that were forbidden during the Passover festival. It is filled with music, dancing, and blessings. Join us for bread, pasta, sweets and special honey pancakes called muflita. We will have live music and an art project for kids.